for about 500 lost relatives. 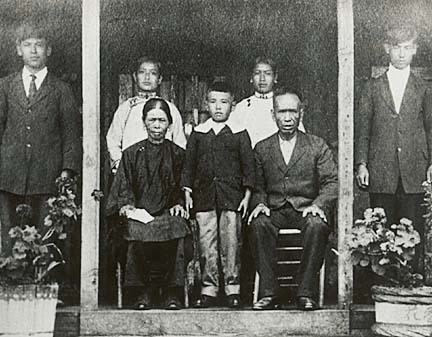 FOR 20 years Nancy Shim-Au kept a portrait of her grandfather Yan Fook Ah Mo Mook Shim, aka Shim Mook, posing on the family porch in Keokea, Maui, with his wife Chu Shee and five of their six children. Together with one more aunt and five uncles on her mother's side, a passel of children and grandchildren, this was the extent of Au's family universe, about 200 members strong. If only portraits could talk. Maybe then Au would have known about Shim's other family. Now Au and other relatives are preparing for a family reunion July 7 through 9 at the Pukalani Community Center on Maui for the 200 kin they know, plus 500 more they don't know: The 500 would-be descendants of Shim Mook and his other wife Tutu Kapoliahi'iaka Napaepae and their six children. 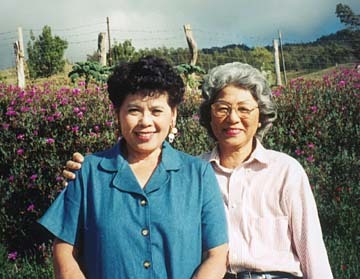 The existence of Shim Mook's Hawaiian wife was largely unknown by Au's generation until last fall, when a death in the family brought 103 strangers from Kohala to the funeral. If you believe you are descended from Shim Mook and Tutu Kapoliahi'iaka Napaepae, the Shim clan would like you to write Nancy Shim-Au at 2963 Ala Oliko Place, Honolulu, HI 96818. "We wondered how they were related to the deceased," said Shim-Au. "When I found out grandfather had two wives I was in shock. I thought, how horrible! But the more I researched, the more enamored I became, because here was a man who contributed so much to the growth of the Kula community. "He was a real visionary who had a piggery, raised chickens, he was a blacksmith, made coffins, and brought a water line all the way from Olinda when Kula was suffering its worst drought in history. "And he took good care of both his wives. He even hired a cook for them." She laughs when trying to imagine the day Lady Chu, as her Chinese grandmother was called, first set foot on Maui, with Shim rushing to the dock to meet her with horse and carriage and second wife. "There they were, his Chinese wife in the buggy, his Hawaiian wife on the horse, all the way home. I can imagine all the Chinese expletives directed at him," Shim-Au said. "But I've learned the two grandmothers got along famously." Henry, Margaret, Kathryn and Thelma. With a rush to complete genealogies, many a family is discovering twisted branches to their otherwise straight-growing family trees, relatives hidden away by another generation raised with different social mores and scandalized by certain events and relationships. At the Portuguese Genealogical Society of Hawaii, Doris Naumu helps people of Portuguese ancestry from Hawaii back to the Old World and understands that a certain amount of counseling goes with the territory. She's been doing this for 19 years, ever since she found her roots through the Family History Centers run by the Church of Jesus Christ of Latter-Day Saints. In her family's case, she found that Board of Health records were sometimes incorrect. "We can't change the public record, but we can change our own history files. There's always joy when people find out who their ancestors are, and I felt that joy." She admits that the joy is often mixed with tragedy and mistaken identities. "We sometimes hate to divulge information that reveal things like suicides. "We try to warn them that people often lived together rather than married. Or they would leave one wife in the old country and find another here." Most importantly, she tries to stress that the older generation had no greater morals than people today. "People haven't changed much. The only difference is that in the olden days people tolerated their families, their spouses. Even when there was abuse. Today, if people are not happy, they just walk away." The nuclear family only became an American ideal because most men could only afford one wife, but a generation of Chinese immigrants had no choice but to obey American exclusionary laws and leave wives and children behind as they left the old country for Hawaii's sugar plantations. This was the case with Shim Mook, who could not have known when or if he would ever be able to bring his Chinese wife to his new homeland. Au was charged with the task of finding more about the history of the family, but she was lost. Her problem was solved with one phone call to Olivia Chong, a cousin by marriage. Chong started researching the Shim family tree 30 years ago. their children Robert, Hannah, Henry, Minnie and Albert. Another son, Edward, had returned to China. "I was listening to the old folks talking and I thought someone has to document this information. It's been very time-consuming, but it's important that you don't rush. I made sure I had documentation for every birth, marriage and death. If you depend on hearsay, it can be very, very sad for the families." This is especially difficult in Hawaii, where children were often given to others to care for as an economic necessity. Chong found a couple of people who had long believed they were descended from Shim Mook, who are not relatives at all. Happily, she was able to lead them back to their real family so the branches of their family tree would have a blood connection. "Poor things. Lost for so long. It's a revelation to find out who you're connected to." Chong keeps all documents in binders and experienced an epiphany in an Office Depot store when she saw a sign that read, "Color is power." She now has different branches of the family tree color-coded for easy reference. All along, she was waiting for someone from the Shim family to ask about the information. Shim-Au was the first to show interest and was surprised to learn one of Shim Mook's nephews, Andrew Lai Ching Shum, in Hong Kong, also had traced the family's roots to royalty in 405 B.C. Chong doesn't fault the younger generation for not knowing their families. "Older folks don't tell you anything. They think that children should be seen, not heard, so you learn not to ask too many questions," she said. Shim Mook's Hawaiian-Chinese daughter Margaret Wong was willing to talk. "She was like a walking historian. She went on and on, and she was so proud of Mook Shim." Now that her parents' generation is passing away, Chong said she is only beginning to realize that she is of an age where she could be considered a kupuna. "I think it's frightening to think we are of the generation that people are coming to for answers," said Chong. "People depend on you, so you have to think about everything you do or say, because that is what is going to be left to the next generation." "Family values, love and respect, these things don't seem as important because there are so many other material needs," said Shim-Au. They're hosting the reunion to reinforce their family ties. "Many people are searching for family," Chong said. "Some people, when they are young, say 'I don't want to be bothered by family,' but in the end, they're the very ones who go looking for family." Says Au, "My biggest regret is that we are only now rediscovering our roots. Can you imagine? One-hundred nineteen years, wasted. This experience has taught me not to take things for granted. Thank goodness for those who put things down on paper. Otherwise, we wouldn't have known about our own family." 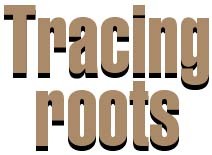 The Sandwich Islands Genealogical Society will be presenting a free program, "Tracing Your Ancestors in England's Public Record Office: Guidelines for North Americans," 9 a.m. Saturday at the Manoa Gardens Recreational Center, 2790-9 Kahaloa Drive. Call 488-4458 for information. The general topic will be identity problems that plague researchers, particularly regarding the ubiquitous names of Jones or Smith, and the problems posed by ancestors known by names that don't correspond to public records. Lois Luehring, a member of the genealogy club, knows firsthand why some gave up their identities. She said she found some rogue relatives in the wild West of the 1800s who were horse thieves and changed their name because a posse was after them. "It's all a part of history. I think everybody will find relatives who weren't all that great and some who were near saint." She has traced her family to France of the late 1500s and what is now Germany, and said, "You never finish genealogy." SIGS will also host a beginner's class, an introduction to genealogy, 9 a.m. to noon April 15 at the Manoa Gardens Recreation Center. There is a $5 fee. Call 671-0038 or 262-8466 for reservations. Church of Jesus Christ of Latter-Day Saints Family History Centers (http://www.familysearch.org). Check offices for hours. Only the Laie office keeps full-time hours: 9 a.m. to 4:30 p.m. Mondays to Fridays plus 6 to 8 p.m. Tuesdays, Wednesdays and Thursdays; 9 a.m. to noon Saturdays; and 2 to 6 p.m. Sundays. There will be a free open house and Asian Genealogy Workshop at the Honolulu West Stake 9 a.m. to noon April 29. 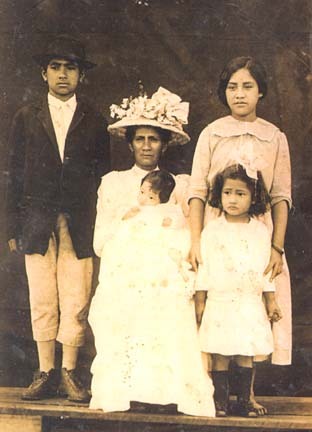 Portuguese Genealogical Society of Hawaii, 810 N. Vineyard Blvd., Room 11, 841-5044. 10 a.m. to 3 p.m. Mondays, Wednesdays, Fridays and Saturdays. Hawaiian Historical Society, 560 Kawaihao St., 537-6271. 10 a.m. to 4 p.m. Mondays to Fridays.